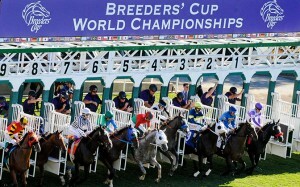 The 31st Breeders Cup gets underway on Friday afternoon with 13 races spread over two days at the Santa Anita Race Track in Acadia, California. Four races will take place on Friday, followed by the remaining nine the following day. The collective purses for the event total $24.5 million, topped by the concluding race, the $5 million Classic. Prior to that, five races each worth $1 million and $2 million, respectively will be held, along with the $3 million Longines Turf Race and $1.5 million Xpressbet Sprint. For the third year in a row and eighth time in Breeders’ Cup history, Santa Anita is hosting the event, the latter mark the track with Churchill Downs for most times serving as the Breeders’ Cup host. The first race gets underway at 5:25 p.m. Eastern with the Juvenile Turf race that has Hootenanny and War Envoy angling to The Classic, which is set to go off at approximately 8:35 p.m. Eastern Saturday night has undefeated Shared Belief looking to maintain its spotless mark. Tonalist and Bayern look to have the best opportunity to spring an upset victory. Another notable entry that figures to be a horse to watch this weekend will be Untapable in the Distaff race that will close out the first day of racing. Currently listed as the favorite at 5-2, the horse is expected to be challenged by either Close Hatches or Don’t Tell Sophia. One horse was scratched from the Turf Sprint race for a non-injury when, according to the Daily Racing Form, Free as a Bird refused to get on a specially constructed plane in Kentucky on Wednesday to fly to the event. The horse’s absence will likely draw little attention since the odds on it were listed at 15-1. Last month, the Santa Anita track debuted a new track after complaints that the old one had become inconsistent, while also raising concerns about potential safety issues for both jockeys and horses. Last year’s Cup may have served as the impetus for the move, after moisture content from the first day of racing resulted in an obvious speed bias that was fixed in time for the final day Originally run in 1984, the Breeders’ Cup expanded to two days in 2007. 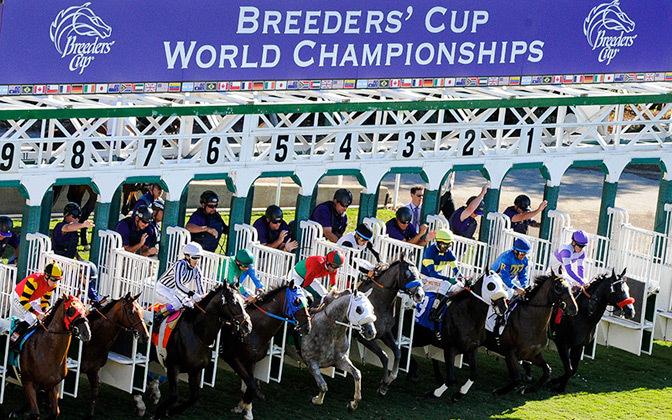 All but the final race will be broadcast on the NBC Sports cable network, while NBC itself will show the Classic to a nationwide audience, with their coverage set to begin at 8 p.m.
Our recommended online racebook for betting on the Breeder’s Cup in 2014 races is Bovada Racebook for US players, and Bet365 Racebook for International players. You can read reviews of both insight into what each of these reputable race books has to offer bettors. Check out our Bovada Racebook Review and our Bet365 Racebook Review.